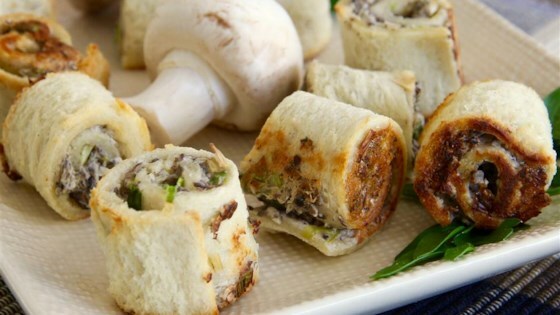 "These are perfect, bite-size mushroom appetizers that are always a hit at parties and family gatherings alike. Even the little ones love them - just don't tell them they're made with mushrooms! The recipe comes from a French-Canadian grandmother whose kitchen creations are magnifique." Chop green onions and mushrooms very finely, to a nearly paste-like consistency. Melt butter in a small saucepan over medium heat; stir in green onions and mushrooms and cook and stir until fragrant, about 2 minutes. Whisk cornstarch into half-and-half; pour into mushroom mixture and cook, stirring often, until thickened, about 3 minutes. Season mushroom mixture with salt, pepper, and garlic powder. Roll bread slices with a rolling pin until very flat and thin. Spread mushroom mixture evenly onto flattened bread; tightly roll up bread slices. Slice each bread tube into 1-inch thick rounds; place rounds onto a baking sheet. Bake in the preheated oven until bread is browned, about 10 minutes. Easy, delicious appetizer. I halved the amount so I thickened the mushroom mixture with grated Parmesan cheese instead of corn starch and added a bit of thyme. Will make again!